We've covered GCD a few times back in Bites #85 & #35. This year, GCD is getting a huge overhaul that brings it into the modern world of Swift. Today we'll take a look at what's changed, let's dive in. TLDR: Grand Central Dispatch now has a richly typed Swift 3 API. Here we create a new queue, and enqueue some image processing work on it. Then, we do the same thing, but back on the main queue, enqueueing the work of setting resized image on our imageView there. For seasoned GCD users, it may take some getting used to, but the new API is much safer and more intuitive to use in Swift. Neat! We've been able to watch Swift 3 materialize through the Swift Evolution mailing list throughout the year, and with WWDC 2016 behind us, we have a pretty clear picture of what Swift 3 will be. Today we'll start taking a look at what's new and changed in this release, and how it can help us build our apps. First up is the "Great Rename", Let's begin. "Better Translation of Objective-C APIs into Swift". When Swift was first announced, one of the huge selling points was how we could use the same Cocoa APIs we were already familiar with. Unfortunately, this meant a lot of Objective-C baggage found its way into the Swift code we were writing. Swift 3 aims to fix this by improving the way Swift imports Objective-C code. Swift 3 removes the repetitive names of the types, and properly brings in a (now required) argument label for the first parameter. 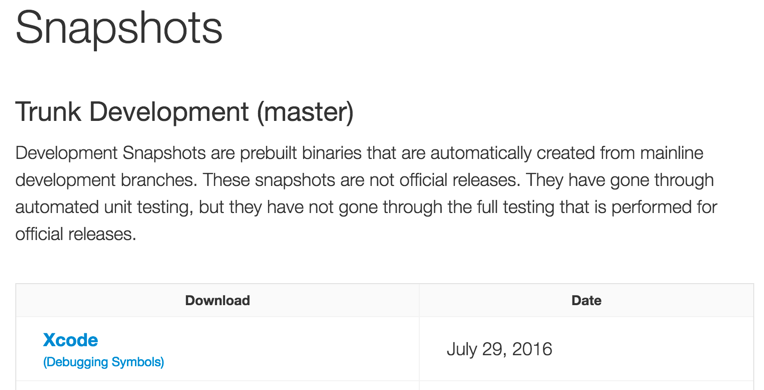 That's all for now, next time we'll continue looking at more Swift 3 changes and enhancements. The extra dash character in the name of our MARK gets us those sweet separators in the source navigator dropdown. 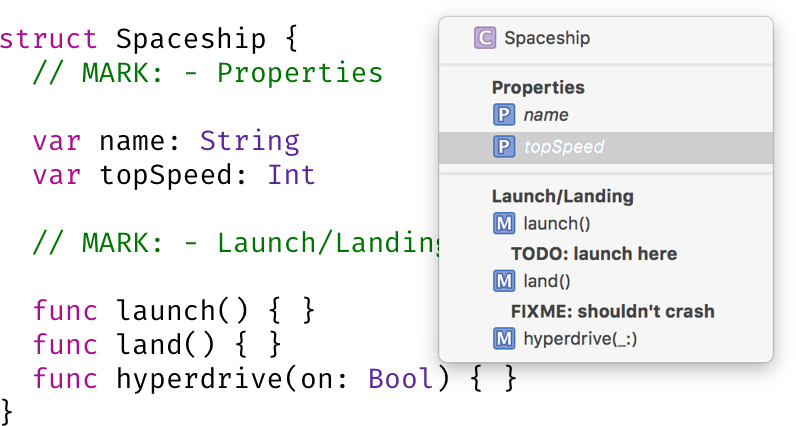 Xcode also supports a similar bit of functionality for TODO and FIXME comments. They'll show up in bold in the same dropdown. Shout out to Jeffrey Sambells for originally sparking this idea! Way back in Bite #1 (zomg!) we talked about initializing View Controllers in Swift. Swift's init functions are still a source of confusion for many newcomers. 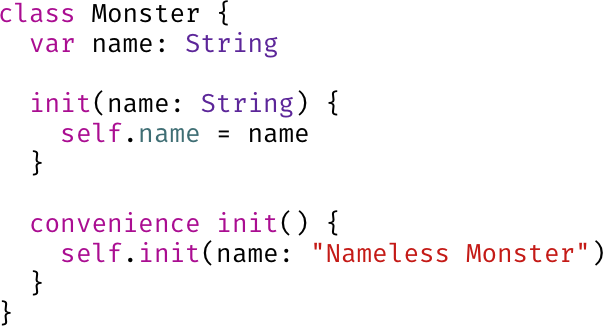 Today we'll look at a couple cases where Swift synthesizes inits for us. Swift offers free "memberwise" initializers for Structs. This means that if we define a Struct, and opt not to define any initializers, one will be synthesized for us, under the hood, using the properties we've given to the Struct. If we add our own though, we lose the synthesized init, and become responsible for defining 100% for the Struct's inits. There's plenty to cover about init'ing things in Swift. We'll take a look in future Bites. Oh, and happy 200th Bite !